This guide provides an overview of each 2017 OWASP Top 10 application security risk and practical tips for writing secure code. It also provides sample code snippets and easy-to-follow remediation guidance to help you improve the security of your applications. Great coding is not just about speed and functionality, it’s about minimizing security risk. Writing functional code in ever-tightening delivery cycles must be managed against risk of vulnerabilities which competent attackers may exploit. By incorporating secure coding practices in the development process, you can minimize your application security risks. The Open Web Application Security Project (OWASP) is an open source application security community with the goal to improve the security of software. Its industry standard Top 10 guidelines provides a list of the most critical application security risks to help developers better secure the applications they design and deploy. Register now to download "A Developer’s Guide to the OWASP Top 10 2017" report. 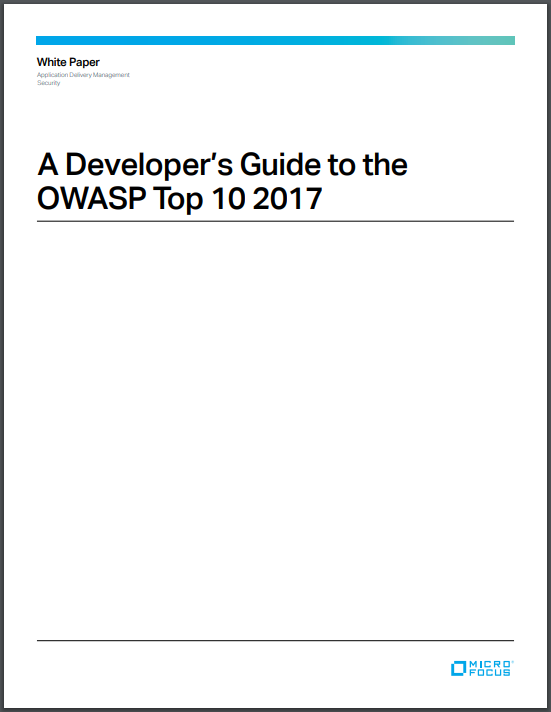 Fill out the form to the right to receive your free copy of "A Developer’s Guide to the OWASP Top 10 2017."